#10: FOR GREATER GLORY. What are you willing to die for? I just read that line in a Lenten reflection yesterday. This movie based on true events in the Cristeros War answers the question. In 1917, an atheistic Mexican government began persecuting the Catholic faithful. Priests are murdered in their churches. Bishops and foreign-born clergy are expelled from the country. The blood of the martyrs flows and saints are born. This is a beautifully filmed epic, the most expensive film ever made in Mexico. Will you stand up for your faith when it counts? The man was a monster even Isis could appreciate, but for the fact that he was a Jew. King Herod the Great was the Roman client king of Judea at the time Christ was born. Jewish prophesy stated that a new king, a Messiah, would be born in Bethlehem, threatening the reign of Herod. When Herod was told that the time had come, that his rival had been born, Herod sent his soldiers to Bethlehem to kill all boys under the age of two. 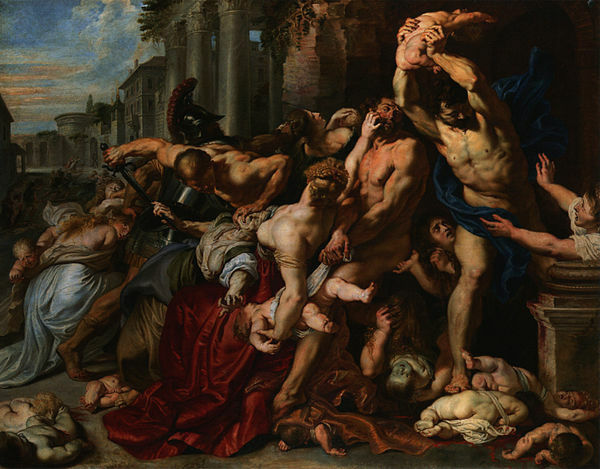 This day, known as The Day of the Holy Innocents, is commemorated in the Catholic Church today. The event was dramatically portrayed by the great Peter Ustinov as Herod in Franco Zeffirelli’s 1977 mini series, “Jesus of Nazareth.” Watch the clip above to get a sense of the horror of the Massacre of the Innocents. The massacre continues today in the guise of human abortion. The number of innocents slaughtered in our country today makes Herod’s atrocity seem like child’s play, except for one thing: the value of a human soul is beyond calculation. The death of a single innocent is a tragedy. I have bounced a few golden oldies from my list this year, such as Ben-Hur and The Ten Commandments, simply because I’ve seen them enough times that I’m a little tired of them.